Cedar Walton, piano; Larry Riddley, bass; Philly Joe Jones, drums. A few weeks ago I was chatting with Miles Davis about the present direction and future potential of jazz. I asked "Can you think of any young soloists at all who have really impressed you during the past year?" Miles reflected a moment, then said, "I'll tell you one young trumpet player I really like--Freddie Hubbard." The endorsement of Freddie by Miles was particularly relevant to our discussion about trends, since the qualities Miles had cited as essential and inevitable--melody, formula, form and good tone--are all conspicuously present in the work of Freddie Hubbard in general, and on this latest album in particular. On his first two albums (Open Sesame, with Tina Brooks and Goin' Up with Hank Mobley), Freddie was represented as a writer only once in each set. The present session shows him in this role on four of the six tunes, and three of these four were arranged as well as composed by Freddie. The three-piece melody section, created here by the addition of trombone, enables the writers to give the group a more intricate and orchestral sound, through the use of three-part harmony and of contrapuntal devices. Jimmy Heath, 34, is the elder brother of bassist Percy and drummer Al. First heard in the early bop years with Howard McGhee and Dizzy Gillespie, he later worked with Miles Davis, Gil Evans and Kenny Dorham, and recorded for Blue Note with, among others, Miles and J.J. Johnson. Julian Priester, a 26-year-old Chicagoan, worked with Lionel Hampton, Dinah Washington and Max Roach, and has been a colleague of Freddie's in the Slide Hampton octet. Cedar Walton, the 27-year-old pianist from Dallas, came to New York in 1955, gigged with Lou Donaldson and Gigi Gryce, and was with J.J. for the better part of two years. Larry Ridley, an Indianapolis contemporary of Freddie's, is 23 and worked there with him in a college band; he came to New York late in 1960 and has worked with a group led by Philly Joe Jones, whose indomitable personality lends its sound to this Hubbard sextet session as it has to so many other memorable Blue Note sessions. "Hub Cap," which is Freddie's nickname, is a minor theme (the minor mode, you will notice, dominates this album). The value of the three way front line becomes apparent in the release of the first chorus, and again in the four-bar launching figure employed in the second (and dynamically underlined by Philly Joe). Freddie's work takes full advantage of the excitement created by this up tempo and by the sturdily driving rhythm section, yet he never overreaches into flamboyancy and never sacrifices tone or sensitive phrasing to technical effects. "Cry Me Not," which in Freddie's modest opinion is "the most interesting tune on the record" (all but one of the rest were his own compositions), was composed specially for the session by Randy Weston, whose successes with waltzes have tended to obscure the fact that he is an equally brilliant writer in the regular 4/4 meter. Like most of Randy's works, this one was arranged by Melba Liston, the gifted alumna of Quincy Jones' trombone section and writing team. The three-horn scoring is used with great skill here, and intriguing use is made of Cedar Walton's arpeggios to supply continuity. Freddie's work has a sustained loveliness and passion throughout, all the way to the exotic ending. "Luana," named for Freddie's neice, is a stays-on-your-mind sort of theme, built on triads. The quiet mood established by Freddie is well preserved by Heath, Priester, Walton and Ridley, leading to a dramatic but never melodramatic finale. "Osie Mae" ("it just sounded like a funky name to me," explains Freddie) has an A-B-A-B pattern. Heath's tone somehow seems particularly well suited to minor themes. Priester clearly shows his debt to J.J. Note the brilliant rhythm support behind Freddie's surging solo. "Plexus," aside from being the title of a Henry Miller novel, means a network or arrangement of parts and is thus a fitting title for the work, in which Cedar Walton assembled some well-integrated, mood-evoking parts for three horns in this particular plexus. Freddie's work on this track is an outstanding example of his fluency. Note the tension-and-release contrast between the extended eighth-note forays and the simpler suspension-like passages using mainly long notes. After Philly's solo, there is a three-way exchange between his interjections, the horns' statements, and the piano-and-bass figures to bring the performance to what Hollywood might call an action-packed finale. "Earmon Jr." is named for Freddie's brother, now working as a pianist in Indianapolis. Compsed by Freddie, it was arranged for this date by Ed Summerlin, the composer and saxophonist with whom Freddie has been studying. (Freddie was featured on the Look Up and Live CBS telecasts with Summerlin, whose jazz-oriented writing for a Methodist Sunday church service created a sensation in 1959.) Walton and Ridley, as well as all three horns, distinguish themselves in blowing passages. 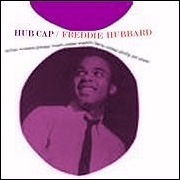 Hub Cap marks an important new step in Freddie Hubbard's career as an ambitions young playing and writing talent. The hub-cap, clearly ready to evolve into a big wheel in musical circles, has never spun to fuller advantage than on these sides.